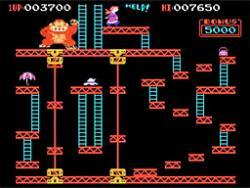 I hope to use this thread to post my progress with Donkey Kong Arcade, my port of the classic arcade game to the CV. I just resumed the game after a long hiatus, so for now you can enjoy a video of some very preliminary work to get stage 3 running. I too felt the same emptiness and feel sorry for him. I too never really cared for his music or career on a personal level but the man as a person seemed to be a lost little boy who never really grew up or found his way. It does feel like a part of the 80s died yesterday with him. On a more personal note the DK level looks killer - keep it up! Sad about Michael, but we can always remember him through our CD's. Your version of DK is many times better than the version we had from the start. You have the ability to see many details in the production of a game. Thank you and good work as always. *The intro screen and the "How High Can You Get?" screen. Wow! Now there's a sight for sore eyes! I just hope the flickering won't be too troublesome after the firefoxes have been added to the rivets level. Considering how unnoticeable the flickering is in Pac-Man Collection, I'm sure you'll do a great job with DKA too. So you're controlling Mario yourself in these latest videos? This would imply that you got the CV controller input routines working. From what I can see here, only the barrels, fireballs, firefoxes and springs are left to include, which I would expect is the really challenging part, mostly in terms of designing a sprite manager that will minimize flicker, but also adapting the enemy AI to the TV screen resolution. Looks like you got your work cut out for you, Eduardo. EDIT: Never mind, I just checked some DK arcade game footage on YouTube. So it IS just me. Edited by Pixelboy, Sun Jul 5, 2009 4:50 AM. Awesome stuff as usual, Eduardo! I'm now a proud subscriber of your YouTube channel. Looking great, man! Maybe at some point I will FINALLY be the proud owner of a good home version of DK with all four screens! Edited by brojamfootball, Sun Jul 5, 2009 12:42 AM. Thank you. You know, porting DK isn't that hard after all. The graphics are a lot of work, more than Arkanoid, but game logic is much simpler. So you're controlling Mario yourself in these latest videos? This would imply that you got the CV controller input routines working. Most of the enemies like springs, fireballs, barrels etc are already implemented, but we won't see them till I finish the sprite driver, which for this game will be very complex. which I would expect is the really challenging part, mostly in terms of designing a sprite manager that will minimize flicker, but also adapting the enemy AI to the TV screen resolution. Looks like you got your work cut out for you, Eduardo. Actually the enemies were pretty easy to do; I ported them in an afternoon. The problem will be the sprite driver. It's quite possible that this version will be the first one with enemies that behave exactly like the arcade, and I believe you will be able to see that especially in stage 1, with the "skull" barrels. As for the sprite driver, since we have plenty of space in the MegaCart, I was thinking about offering the user the option to select between two different sprite drivers: for those who like colorful sprites (myself included), you can select enemies with two colors, though flicker could be a little more intense in some places, while those who absolutely hate flicker can select enemies with just a color. Stage 1 will be specially challenging for the sprite driver, as that stage uses up to 16 enemies on screen. Considering 2 sprites per enemy, you have all 32 sprites allocated to enemies. So the sprite driver would need to deal with sprite multiplexing too. Of course that only happens in extreme cases, for a short period. Yeah, then maybe you can make a ColecoVision version of Gorf that actually resembles the arcade game. Hey, any plans for that ColecoVision BASIC you mentioned in passing earlier? That'd be pretty sweet. Martijn Wenting claimed that he had made a Vectrex BASIC, but I was never able to find it online at all... not on his site, not on any newsgroups, nowhere. A year later, I feel like he was full of hot air and that no Vectrex BASIC ever actually existed. Simpler than a paddle moving left and right, with a ball traveling in diagonal trajectories and hitting immobile bricks? I find that hard to believe. Wait a minute, DK scrolling in stage 2? You're going to do it after all?? That's great! I'm glad you changed your mind about that! I put a lot of work into those horizontal DK scrolling graphics... Same goes for DK's intro screen animations. I can't speak for others, but I like that idea a lot. I believe their envy will be directly proportionate to the quality of the sprite driver, and also the arcade-faithfulness of the sound output. For the rest, I'd say you're already on the right track. Wow! Donkey Kong is really looking awesome. Great job. Edited by opcode, Tue Jul 7, 2009 9:47 AM. I wonder if those 'new' levels that that guy made for the arcade version could be hacked into this? That is if he gave permission of course. I'd pay big money to play those levels. Currently the only way you can play them is if you own a DK arcade machine and have his hack installed, which isn't an option for most of us. They were fun levels, brutally hard, but fun. I got to play it at MGC two years ago. Currently the only way you can play them is if you own a DK arcade machine and have his hack installed, which isn't an option for most of us. A 'Super' Donkey Kong cart with new levels would be awesome. Something that would add replay value to those of us who have played the original DK to death.